Broad-Breasted Whites take over the commercial market! Gravy-lovers and lazy meat-carvers might rejoice at the amount of white meat in modern-day turkeys, but for the birds themselves, abnormally large breasts come at a high cost. These top-heavy turkeys can no longer fly, and often have difficulty walking.5 In addition, with such massive chests, they can’t even get close enough to physically mate with each other.4,5,6,7 So in fact, almost all turkeys eaten this Thanksgiving will have come from artificial insemination! And as messy and arduous as that process sounds, it’s not the only indignity that today’s turkeys have to face; despite gains in breast size, these domestic birds have lost volume in a more critical body part—the brain. Nearly 3000 years of careful selection have induced drastic genetic changes within the brains of our delicious, large-breasted friends. When compared to their wild counterparts, the brains of domestic turkeys are visibly smaller, with a startling 30% loss of volume.8 Even more strikingly, this reduction in brain size appears to be a universal trend across a range of domesticated species.8-21 But what do turkeys,8 ducks,9 horses,10 and even rainbow trout11 have in common (both genetically and environmentally), that can explain the prevalence of this phenomenon? 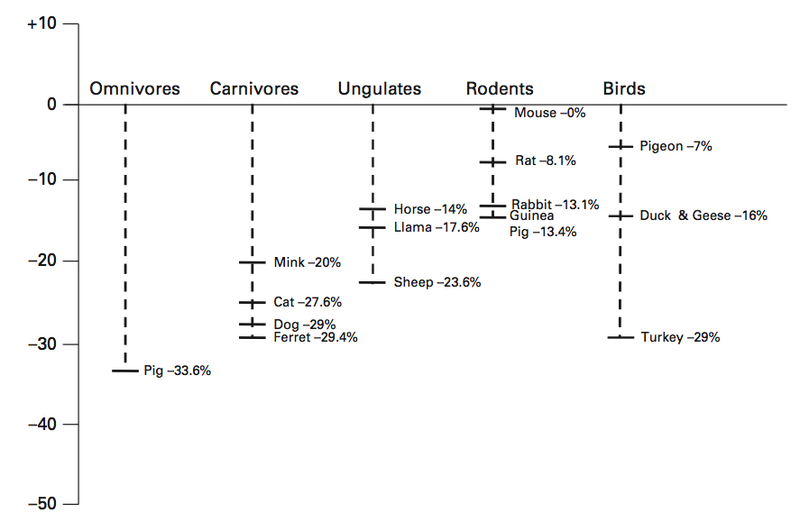 From Zeder (2012), a comparison of the reductions in brain size across domesticated species (as compared to their wild counterparts). One possibility centers on the economic pressures of livestock farming. To increase Feed Conversion Efficiency—the amount (and thus cost) of feed that an animal converts to body weight—substantial genetic changes must occur. For example, turkey farmers can maximize profits with modern breeds that not only grow to market size twice as fast, but also can convert food into body weight more efficiently (20% better than a 1966 breed).22 But if more energy is allotted to the conversion of food to mass, less is available to remaining body functions—including a very energy-demanding brain. In humans at least, the brain comprises only 2% of body weight, but requires 20% of the body’s total oxygen consumption (a measure of basal metabolic rate).23,24 In fact, it’s calculated that in young children, the brain may account for 50% of total oxygen consumption!25 We could then speculate that evolutionary pressures for enhanced weight gain might inadvertently select for smaller (and less energy-demanding) brains. Homing pigeons (called carrier pigeons when used for delivering mail) were used extensively during World Wars I and II; they carried critical messages through enemy fire and even took aerial reconnaissance (when strapped with automatically-timed cameras, pictured here). After you read about war pigeons like Cher Ami, you’ll want to hug every pigeon you can find! Still, how much of these brain changes are genetic versus environmental? Maybe farm life is just boring, and doesn’t provide enough mental stimulation to grow a big brain. This appears to (somewhat) be the case for minks; when raised in broader enclosures, domestic minks had slightly larger brains than their closely caged siblings.20,21 Even so, brains of wild minks still outweighed those of domestics, suggesting that genetics has a stronger effect.20,21 More conclusively, since some domesticated animals escape captivity, study of these feral populations has shown that even after generations of living in the wild, overall brain size is unaffected;27,28 it’s the genetic background that matters most. In the end, it turns out that millennia of human manipulation to the genes of domesticated animals have indeed created long-lasting and dramatic effects—much to our benefit. So for this holiday season, remember to pause and give thanks to the countless animal breeders, artificial inseminators, and research scientists that make a centuries-old tradition, Thanksgiving, possible. And, be grateful that lack of brains doesn’t make your crisp-skinned, juicy-meated turkey any less delicious! 1) Speller et al. (2010) Ancient mitochondrial DNA analysis reveals complexity of indigenous North American turkey domestication. PNAS 107(7):2807-2812. 2) Viegas. Native Americans First Tamed Turkeys 2,000 Years Ago. Discovery News (1 February 2010). 3) Historical Success Stories. USDA: Agricultural Research Service. 4) A brief history of turkey research and the role of the Beltsville Agricultural Research Center. USDA: Agricultural Research Service. 5) Madrigal. Give Thanks? Science Supersized Your Turkey Dinner. Wired (25 November 2008). 6) Reese et al. Selecting your best turkeys for breeding. The American Livestock Breeds Conservancy. 7) Chant et al. Unnatural Turkeys: A New Marketplace Podcast. Freakonomics (17 November 2011). 8) Ebinger et al. (1995) Volumetric analysis of brain structures, especially of the visual system of wild and domestic turkeys (Meleagris gallopavo). J Hirnforsch 36(2):219-28. 9) Ebinger. (1995) Domestication and plasticity of brain organization in mallards (Anas platyrhynchos). Brain Behav Evol 45(5):286-300. 10) Rohrs and Ebinger. (1998) [Are zoo Przewalski horses domesticated horses?] Berl Munch Tierarztl Wochenschr 111(7-8):273-80. 11) Marchetti et al. (2003) Effects of hatchery rearing on brain structures of rainbow trout, Oncorhynchus mykiss. Environmental Biology of Fishes 66:9-14. 12) Zeder. “Pathways to Animal Domestication.” Biodiversity in Agriculture: Domestication, Evolution, and Sustainability. Ed. Gept et al. New York, New York: Cambridge University Press (2012). 13) Ebinger. (1975) Quantitative investigations of visual brain structures in wild and domestic sheep. Anat Embryol (Berl) 146(3):313-23. 14) Ebinger and Lohmer. (1987) A volumetric comparison of brains between greylag geese (Anser anser L.) and domestic geese. J Hirnforsch 28(3):291-9. 15) Plogmann and Kruska (1990) Volumetric comparison of auditory structures in the brains of European Wild Boars (Sus scrofa) and Domestic Pigs (Sus scrofa f. dom.). Brain Behav Evol 35:146-155. 16) Price. Animal Domestication and Behavior. Wallingford, Oxon and New York, New York: CAB International (2002). 17) Price. (1999) Behavioral development in animals undergoing domestication. Applied Animal Behaviour Science 65:245-271. 18) Rehkamper et al. (2008) Mosaic evolution and adaptive brain component alteration under domestication seen on the background of evolutionary theory. Brain Behav Evol 71(2):115-26. 19) Kruska (2009) The effect of domestication on brain size and composition in the mink (Mustela vison). Journal of Zoology 239(4):645-661. 20) Kruska and Schreiber (1999). Comparative morphometrical and biochemical-genetic investigations in wild and ranch mink (Mustela vison: Carnivora: Mammalia). Acta Theriologica 44(4):377-392. 21) Kruska. (1996) The effect of domestication on brain size and composition in the mink (Mustela vison). Journal of Zoology 239(4):645-661. 22) Havenstein et al. (2007) Comparison of the performance of 1966- versus 2003-type turkeys when fed representative 1966 and 2003 turkey diets. Poultry Science 86:232-240. 23) Rolfe and Brown. (1997) Cellular energy utilization and molecular origin of standard metabolic rate in mammals. Physiological Reviews 77(3):732-753. 24) Wang et al. (2012) Evaluation of specific metabolic rates of major organs and tissues: Comparison between nonobese and obese women. Obesity (Silver Spring) 20(1):95-100. 25) Kennedy and Sokoloff. (1957) An adaptation of the nitrous oxide method to the study of the cerebral circulation in children; normal values for cerebral blod flow and cerebral metabolic rate in childhood. J Clin Invest 36(7):1130-1137. 26) Walcott. (1996) Pigeon Homing: Observations, Experiments, and Confusions. Journal of Experimental Biology 199:21-27. 27) Kruska and Rohrs. (1974) Comparative-quantitative investigations on brains of feral pigs from the Galapagos Islands and of European domestic pigs. Zeitschrift fur Anatomie und Entwicklungsgeschichte 144(1):61-73.